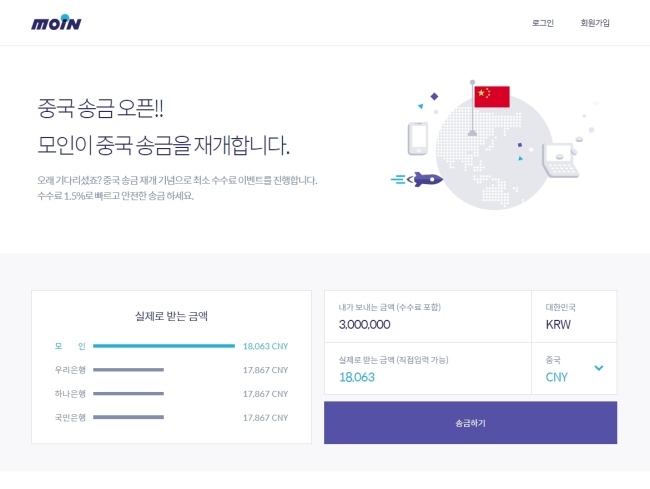 South Korean financial technology startup Moin resumed its cross-border money transfer service without currency conversion fees double-charged to residents in China, starting Aug. 1, according to Moin on Wednesday. This came after Moin’s remittance service with China was suspended since May 2017. Taking advantage of Moin’s prefunding scheme, those who receive money transferred from Korea will not be charged won-to-dollar and dollar-to-yuan conversion fees, unlike interbank methods, cutting the commission fee by up to 90 percent, Moin said in a statement. Expats in China will also be able to receive wired money in the form of yuan, if they charge it into e-wallets like WeChat Pay or Alipay on their mobile phones. If a recipient uses an express service to receive money at Chinese banks, such as the Industrial and Commercial Bank of China, Bank of China, China Construction Bank, Bank of Communications and 10 others, the transaction will be completed in three hours, it added. Korean financial authorities had ordered the business suspension of all remittance companies and demanded they get licensed under a new set of guidelines. Moin first launched the service in December 2016.